Not receiving and/or eligible for EI benefits. Able to commit to a program spanning 30 hours/week for 16 weeks from April 23-August 9 2019. We are looking for enthusiastic youth who are eager to learn new skills, expand their professional networks, and work hard! Youth will earn certifications like First Aid, FoodSafe, Serving it Right, Superhost, and more, while receiving individualized coaching from Employment Counsellors on building their careers and achieving life balance. Youth will also receive support in job searching, interviews, and resume and cover letter writing. If you are an employer with a work opportunity, please contact our Job Developer, Mike Taculad, at mtaculad@alexhouse.net. Happy Anniversary Youth KRU Employment Program! 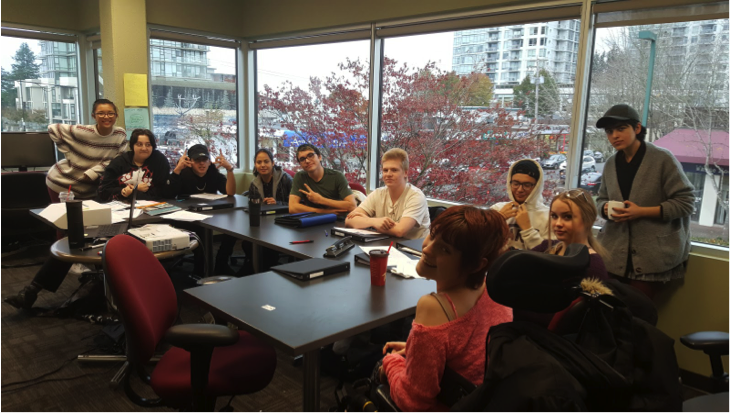 In October of 2017 Alexandra Neighbourhood House was approved for funding from Service Canada to start up and run a Youth Employment Program for the White Rock/South Surrey area. Quickly assessing the needs of the program and putting their plans into action, they hired the first Program Facilitator for the team; Valerie Wong. Knowing that they wanted to have the first Cohort of participants start at the end of that month, Valerie dove right into creating the curriculum, organizing the workshops, setting up the new office and screening potential participants. While she was busy doing that, the second team member Mike Taculad was brought on board as the Job Developer. Mike brought along a wealth of experience and jumped right into action by building relationships with local businesses, determining what the job market was in the area and preparing the job placement agreements. Just as they were almost ready to launch the first Cohort, Jessika Houston was brought on the team as the second Program Facilitator. She quickly learned the material, got a base understanding of what the program was all about, and 2 days later started facilitating to the first group of participants. To say it was a whirlwind for all of us is an understatement but we did it and we have continued to grow, evolve and develop what is now known as the Youth KRU (Knowledge, Resources and Understanding) Employment Program. The Youth KRU Employment Program is designed to help youth (ages 15-30) that have barriers to employment gain the life skills and employability skills that they require to be successful in attaining and retaining a job. The youth come into the office for 6 weeks of training, certifications, role playing and workshops before heading out to their work experience for an additional 10 weeks. Our job developer Mike works closely with each participant to identify what types of skills and experiences they are hoping to gain in their work experience and then places them in an appropriate role with a willing local company. Some of the companies that we have been fortunate to have work with us so far include; Sensa Float, Peninsula Executive Suites, Shoppers Drug Mart, Robokids, Open Box, Washington Avenue Grill and Montana’s. In just one year we have had 45 participants complete the 6-week training program, 80% of whom have gained employed through the program and 6% have gone back to school! We have seen participants gain confidence, friendships, a sense of community and a feeling of pride in addition to learning the skills and abilities that they need in order to work. We have seen the lives of so many change right before our eyes, and we look forward to sharing that experience with many more in the coming years. 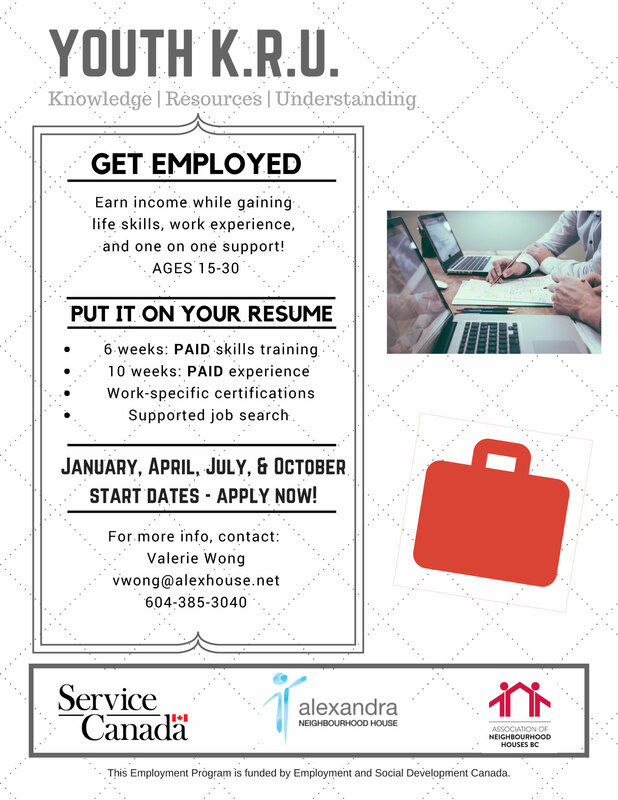 If you know of an employer that would be interested in working with us, or if you know a youth that you think could benefit from the program, please reach out to Jessika Houston at Jhouston@alexhouse.net or 604 385 3040 ext. 3 for more information.